A McMansion is like obscenity: you know it when you see it. I often tell interviewers who ask me to define the term “McMansion” that McMansions are like obscenity: you know it when you see it. Like beauty (and obscenity), McMansions seem to be in the eye of the beholder. The simplest way to define a McMansion is: a poorly designed, poorly executed, oversized house. But there’s something more to them than looming entryways, vinyl siding, and mismatched windows that causes the knee-jerk hatred they rouse in so many. In part, the wounds are historical: as the 2008 crash unfolded, McMansions became the symbols of aspirational hubris, of excess, of wanting too much and borrowing too much to get it. Today, McMansions are no longer quite same symbols of economic hubris and loss. (If the McMansion were truly dead, home size would have never risen to new heights shortly after the recession). What they truly represent, what they’ve always represented, is how under late capitalism, modes of consumption and commodification reach ever-deeper into our daily lives. Like reality TV and video art installations, McMansions are inherently postmodern. Postmodernism, to paraphrase the philosopher Frederic Jameson in an essay on the subject, involves the commodification of culture, art, and, ultimately, of one’s lifestyle. Postmodernism removes context from subjects, weakens or eliminates historicity, and effaces the divide between high culture and consumer culture, reducing culture to a series of images, the consumption of which becomes a new sort of commodity fetishism. The separation of individual images from their historical contexts is what leads to the hackneyed, askew aesthetics of McMansions themselves, which can boast, say, three types of windows invoking three types of styles, assembled alongside a collage of details from seventeenth-century French Baroque, eighteenth-century Colonial, and nineteenth-century Victorian, all majestically rendered in architectural foam. The erasure of the professional architect from most residential architecture is an unforeseen result of this attack on “high culture” — after all, who better to design a house than a housewife with a window catalog? Formally, the McMansion is the result of attempts to architecturally assimilate a disparate, ever-growing list of wealth signifiers, something I have called the “Checklist Aesthetic,” named after the key plot device in the HGTV hit show House Hunters. Every episode of House Hunters starts the same way, with a checklist of atomized “must-haves”: wood floors, five bedrooms, huge yard, tall entryway, and so on. Should a house fail to contain any of these various elements, it is ultimately rejected in favor of one that does. Screenshot of a House Hunters checklist. Each of these assets is a tick mark that adds to a home’s selling value. If you’ve ever seen an episode of HGTV’s Designed to Sell, you may have noticed how the magic number in the corner of the screen (selling value) goes up, up, up, each time one of these assets is added. It’s not just structural assets that increase selling value, but individual signifiers of wealth and power, like tall foyers, chandeliers, material finishes like stone and wood, certain wall colors, and the latest, trendiest furnishings. These signifiers originate in contexts that give them the character of wealth, but most have been stripped of those contexts — in the words of Lacan, their signifying chain has broken down. The greater the accumulation of these symbols of wealth, the “better” one’s home becomes, regardless of how much one’s family needs a “snack room” or eighty foot ceilings. The housing bubble transformed the material culture of homemaking, from the 1950s-era pattern of consuming commercial items in the home to the current era where the home itself is consumed. 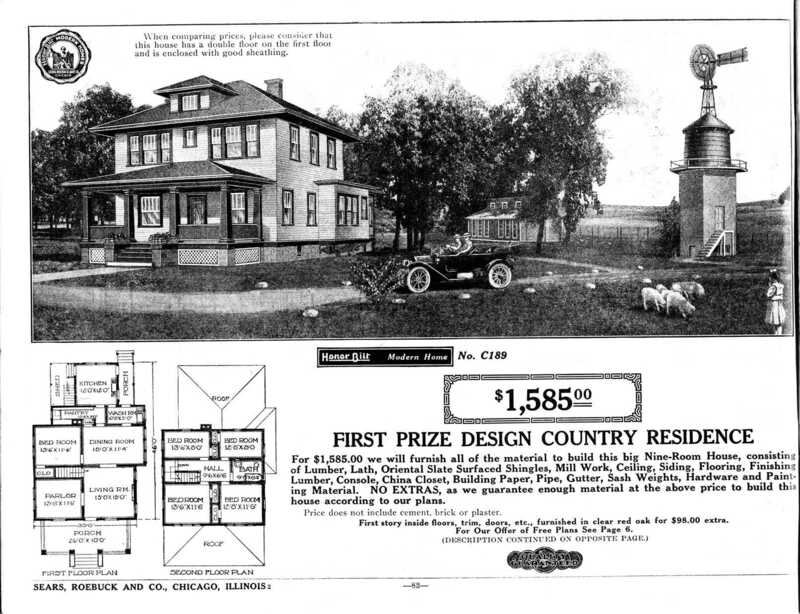 The 1915 home featured above was designed to be livable; the 2000s home, to be salable. And though the real estate market has settled in recent years, the power of home consumption maintains itself through America’s new favorite pastime: remodeling. In previous eras, people remodeled when needed, replacing worn items, structures and appliances. The idea of total home transformation essentially emerged alongside mass production, which brought down costs. Even so, whole-home redecorating was mostly a pastime for wealthy families. The growth of specialized electronic media was key in fostering today’s remodeling culture. HGTV is one example, but internet sites like Pinterest, Houzz, and Dwell keep people transfixed with the consumption of home improvement and decoration as a permanent hobby and pastime, regardless of whether individuals plan to sell their home. Home decorating trends, which were seen in the twentieth century as changing on a decade-by-decade basis (a relatively rapid pace, thanks to mass media), have been changing in today’s era of hyper-consumption at an observable rate of every two to four years. This rate of consumption is, of course wasteful and unsustainable, as is the McMansion itself — isolated from public life, requiring long commutes by car (with an interior plan that isolates members of the household from each other), large quantities of natural resources to build, and energy to heat and cool. Apart for the Hummer, there are few clearer examples of conspicuous consumption. One interesting casualty of this era of hypercommodification is the loss of the concept of permanence in the relationship to the home. In the last forty years, no home has been truly permanent, between rigorous schedules of redecoration or renovation and the sheer speed at which people were buying, selling, and flipping homes at the height of the bubble. These spatial transformations at the hands of capital have left us permanently ill at ease with the appearance of our homes. Our homes will never be good enough: as soon as they become such, the whole cycle begins anew, and the endless wheels of consumption keep turning. Kate Wagner, an architectural writer and critic, is the creator of the viral blog McMansionHell, which roasts the world’s ugliest houses from top to bottom. She studies the history and theory of architectural acoustics as a graduate student at Johns Hopkins University and the Peabody Conservatory.